3 9 gorgeous styles, each only $39.99. Save up to 65% off compare prices! Hurry…this special sale event ends tomorrow, 5/19! 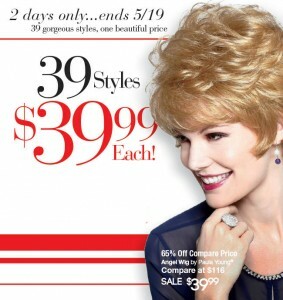 This beautiful, exclusive collection of 39 wig styles priced at JUST $39.99 is located here. Remember: this exclusive online sale event lasts for a VERY limited time…2 days only! So browse our special collection of 39 wigs at $39.99 each, make your picks, and enter the special code (located at the top of the sale page) at checkout. It’s that simple! This entry was posted in Special Savings & Sales and tagged Paula Young, Paula Young Wigs, wig sale. Bookmark the permalink.